This is a fun summer read for the chapter book set. Lilah and I both enjoyed Iva’s antics. Iva’s mother and aunt have decided to bring all the children (six of them!) to the beach for a week. Lilah has no idea why that made me laugh hysterically. Poor Sissy One and Sissy Two. I hope they’re well-stocked with cocktails. While the little kids do little-kid things and the teenagers do teenager things, eight-year-olds Iva and Heaven do what they do best – bicker. 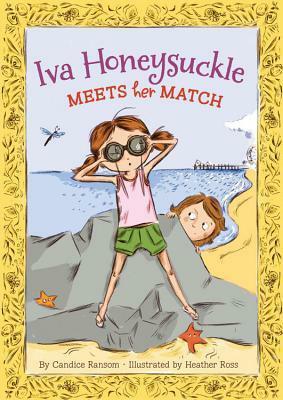 Iva is desperate for adventure, and yearns to prove the existence of Chessie the Chesapeake sea monster. While Heaven is off playing with a new friend, she takes her mother’s camera to document the monster…and drops it in the ocean. Her anxiety and guilt mount as her mother searches for the missing camera. This is a funny, light, relatable read. Iva is a believable hero who reminds me a bit of Clementine. She isn’t well-behaved, though she’s a good kid. She makes mistakes, she gets too excited and doesn’t think before acting, and she’s not sure what to do when things go wrong. Her boundless enthusiasm is infectious, and her exasperation/love for her same-age cousin is endearing. Highly recommend.